FCGCT Commentary: We are moving from mindful, to Heartful. Let go of the mind, and solely flow from the Heart. The New Moon occurs at 2:57 (BST) on April 16, 2018 at 26°Ar02′. The New Moon in Aries seeds the intentions of the new astrological year. Right now, Chiron is teetering on the final degree of Pisces, preparing to make his debut into Aries. Behind everything, is an urgent collective intention to end suffering combined with tidal emotions that range from great compassion to desolate despair. For the last 8 years, we have had to make peace with our pain and find meaning in our suffering. When Chiron moves into Aries, our style of both healing and suffering will change. In astrology, Chiron is symbolised by a glyph that is shaped like a key. After all this time imprisoned in the global house of the lost and forgotten, now the key is in the door. Uranus is an unstable, unpredictable energy yet it can also represent awakening too. We may feel jazzed up, electric, sparkling with great ideas that we want to set into motion. This is a lunation where we could receive cosmic downloads as Uranus is the higher frequency of intellectual Mercury. Universal information is available which can help us dare to display our unique talents. Flashes of inspiration could fortify us with the courage to take independent action. But it is unpredictable – remember, the tiger is coming out of the cage! Mercury is still on the degree of his station too and sometimes this can also be a shaky influence. The main caution advised is to pause for breath if possible. Take a moment, survey your surroundings, listen. This is new territory. Venus in possessive Taurus is opposing giant Jupiter. It makes me think of how starved that tiger is! Imagine, you’ve just been released from a cage and your tummy is rumbling and everything just smells so good! What do you chase after first? Venus opposite Jupiter can give us an urge to want it all and it’s hard to discriminate between what is good for us and what isn’t. We need to stay mindful of excess and over-consumption. Just because we want it, doesn’t mean we should have it. Mars, ruler of this lunation, is currently marching through Capricorn. This sign brings out the best in our inner soldier, so we do have a healthy dose of personal responsibility and accountability in the mix. Mars however is restricted and intensified with conjunctions to both Saturn and Pluto. We’re either powered up and ready to lead with iron-like will or we feel frustrated to the point of volcanic eruption. We could see conflict at every turn and enemies hiding in plain sight. With Mars in cautious Capricorn, we would do well to figure out our strategy first before leaping into the fray. Aries relates to beginnings – the initial spark of an idea. Capricorn is about manifestation of the original intent. Both of these signs are strongly tenanted in this chart. We could be very focused on seeing the results of our actions quickly. However, with Mars conjunct Saturn and Saturn now stationary as he turns retrograde in two days’ time, the results of what start now may take longer to manifest than we’d hoped. Then again, that isn’t always a bad thing. 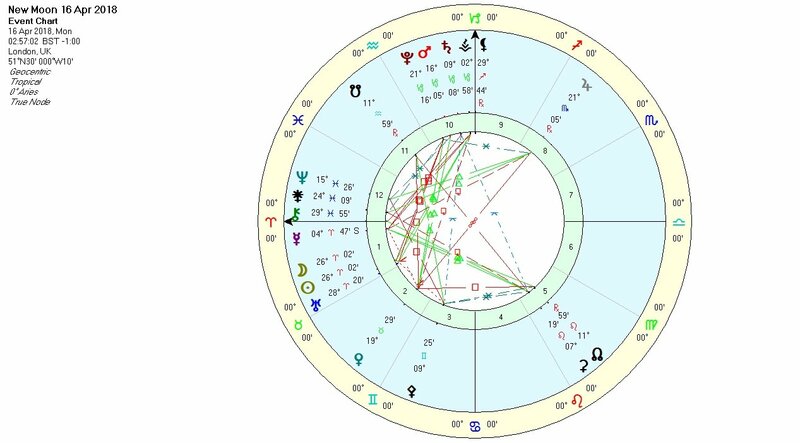 The New Moon is square to Pluto which throws in issues connected to mistrust, especially perhaps of authorities. We could find it difficult to know which orders to follow and which to rebel against. One major feature of this chart is that there are no major planets in air. Poor Pallas in Gemini is going to have her work cut out for her trying to establish a dialogue or think her way through a problem. It could feel as though we’re running on instinct and bravado. Still, although Mars is challenged at either side, he has help at hand in the form of Venus (trine) and Neptune (sextile). Love and compassion can help to dissipate tension. If we can remain true to our values and find a quiet moment to listen to our soul, we’re more likely to figure out the best next step. Perhaps the Uranus surprise is that what we thought was dead and gone (Pluto) is suddenly revived. Maybe some of us get a second chance when we thought we’d blown it. Often, it’s when we think we have exhausted all avenues that we’re forced to use our creativity and initiative to come up with a way out. Although this New Moon in Aries has its difficulties, there is powerful potential to rise up out of the ashes and start again.